AYM endeavor involves utilizing the arts to depict, discuss, and define the trauma experienced in war-torn African societies. The goal of the art is to begin not only reconciliation, but also achieve violence prevention. AYM recently staged "Representations of Violence: Art about the Sierra Leone Civil War." The art depicted the ravages of war, serving as a both a catharsis of trauma and a catalyst for conflict resolution. The exhibition also engages the world's collective memory, placing the tragedy of Sierra Leone’s Civil War in the context of wars in modern history, from the Napoleonic wars of Europe, through World War II to Vietnam, on up to the present in Iraq. AYM’s exhibition aimed to educate African and Western audiences of a shared experience–––and responsibility–––building a bridge from disinterest to involvement. Porter Butts Gallery, Memorial Union, University of Wisconsin -Madison, February 28-March 30, 2003 with the title "Representations of Violence: Art about the Sierra Leone Civil War." Art & Cultures Gallery, Alverno College, Milwaukee, August 18-September 18, 2004 with the title, "Sustaining Peace in the Wake of Violence: Images fromthe Sierra Leone Civil War." VSA Arts of Georgia, Atlanta, March 1-April 22, 2005 with the title,"Truth and Reconciliation: Perspectives from the Sierra Leone Civil War" held in conjunction with artwork by survivors of the Aberdeen Amputee Camp. Published Book: Representations of Violence: Art about the Sierra Leone Civil War/edited by Dr. Patrick Muana and Chris Corcoran. 2. Creating a managerial process to translate ideas into action at our national chapters. 3. Physically bringing together the leaders of the various national chapters to lay the ground work for our mutually acceptable goals and objectives, one of which is the GAYA. In support of the Artists whose works constitute the exhibition, "Representations of Violence: Art about the Sierra Leone Civil War", we organized the first "Artists Participation and Appreciation Gala" at the Sierra Leone National Stadium on January 11, 2003. In February and March 2003 we organized an international conference and an art exhbition at the University of Wisconsin, Madison under the theme: Representations of Violence: Art about the Sierra Leone Civil War. The conference brought together Scholars from Europe, Germany, United States and Africa to educate Americans about a number of important issues relating to Sierra Leone, the power of art to document civil injustice and promote individual and civic healing, and the role that disability plays in culture. The purpose of the exhibition focused on exposing how the turmoil of civil war affects the lives of people. The Sierra Leonean Artists have created moving visual interpretations that tell stories of the people, of fear and of hope. “Representations of Violence: Art about the Sierra Leone Civil War," is an important achievement within our Movement, for it presents an opportunity for people to unite in an attempt to see and improve the conditions in Sierra Leone. This is a prime example of what our organization does to achieve its goals of the pursuit of peace, justice, and human rights. A Catalogue of the conference papers and paintings will be available in March 05 and the E-book version will follow immediately. 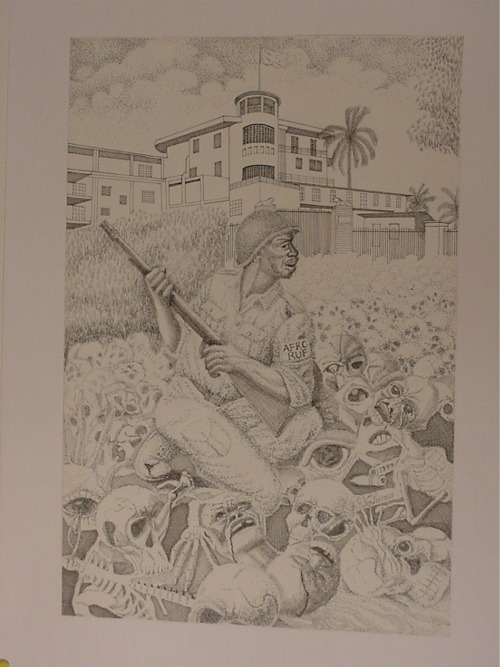 The lone soldier in this pen and ink work represents the combined Armed Forces Revolutionary Council (AFRC) and the Revolutionary United Front (RUF) of Sierra Leone. The building in the background is the State house, the seat of government of the Republic of Sierra Leone and its symbol of political power and authority. The dead and bleeding victims lie among skulls littered around State House. This is a violent outcome to political power guided by the gun. The soldier therefore is symbolizing the insatiable quest for power that led to wanton destruction of lives and properties during the eleven-year war. The soldier has come to represent death and, with the power of the gun, has taken control over State House. The Secretary-General should ask the UN to give moral and financial support to organizations like the AYM that focus on telling the stories of Africa through Art to organize a Global Culture of Peace Art Movement, documenting the events of the decade of peace and embarking on a massive travelling exhition to educate and share the experiences of nations through their Artists with the world to ensure a Global Collective Memory. This show must also be complemented with an Online version that can be accessed by people everywhere and it must be hosted on the United Nations Server. Through art a feeling of happinessis possible, and happiness leads to peace, peace to prosperity. Another advice for the Secretary-General is that specific criteria must be established to ensure that nations are committed to the works of their artists and that after the exhbitions, they will be responsible for permanently procuring these artworks and displaying them for the public good and for posterity. We hope to use our online presence, our art exhbition catalogue to propagate our vision an mission to the world for the peace of Africa. We are also a growing Movement, presently with chapters in Sierra Leone, Liberia, Kenya, Somalia and Nigeria. By the end of the decade we hope to have chapters in all the African countries. Through this Movement, we conceptualize, plan and implement programs and projects pertaining to a culture of peace. Through our travelling Art Exhbition which has been shown at the University of Wisconsin, Madison, Alverno College in Milwaukee and at VSA Arts of Georgia in Atlanta, we continue to share the power of art to educate, to inform and to heal in matters of structual and cultural violence. Our second "Artists Participation and Appreciation Gala" will take place again in January 2006. We are planning the first Global African Youth Assembly (GAYA) in 2007 and annually thereafter with a major focus on a decade of peace in 2010. We have also planned and are in the first phase of the project, "Imagining Africa: Building Bridges and Raising Awareness through Artistic Endeavors (Working Title)." This project will be completed in 2007 to culminate with the first GAYA. Imagining Africa has brought together 15 American Artist with little or no cultural understanding of Africa and they have begun working and exploring Africa, to learn about the continent and its people and depict its positive aspects of their communities and culture for awareness and peace building.